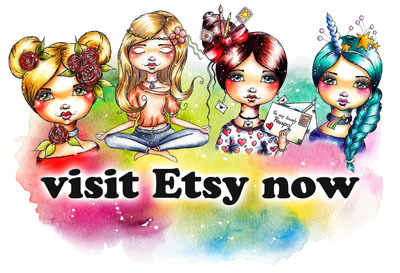 I am not only a Mixed Media Artist and Lover of all Things artsy and creative, I am also a Plannergirl. 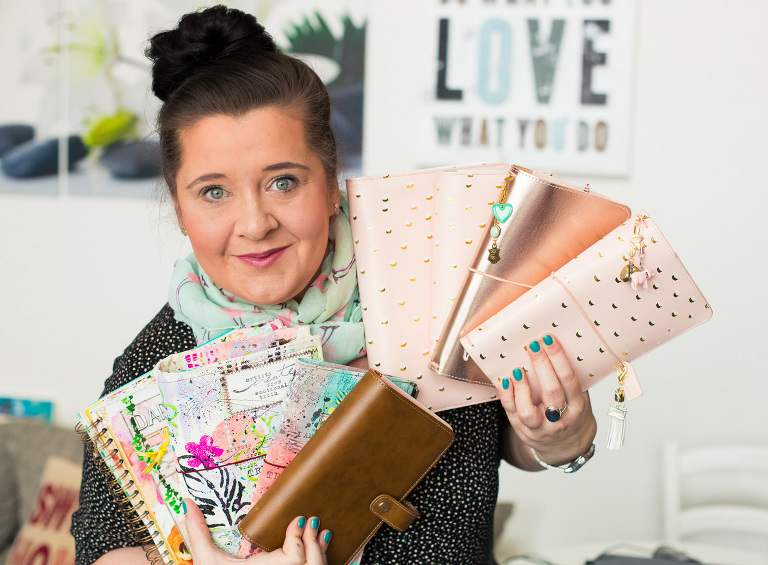 When it comes to planning, I am a Fan of Form & Function, which means I love to work in pretty decorated Planners, however, it also needs to be functional and do the Job in first Place. Hence all of my Planner Inserts that I offer are designed with a good Mix of Form & Function in Mind. Some are more whimsical an quirky, some are more clean and simple . . . no matter which Design and Style you prefer . . . all of them will help you keep track of your daily & weekly schedules & appointments, your health & fitness, your mealplanning etc. and help you to jot down your ideas & important notes in style . . . Especially for those of you who don`t want to spend hours and hours on decorating their planner inserts (because let`s face it . . . life gets busy sometimes and we still want out Planner to look cute and pretty from the inside) . . . you can still add stickers, embellishments, washitape etc. and pimp it up to your liking, but if you dont find the time, it will still look pretty. All of my printable Planner Insert Packs include many different Versions so that you can set up your whole Planner in a cohesive Style. They include Designs like Dashboards, different Variations of 1 Day on 1 Page, Week on 2 Pages, Food- Health- & Fitness Tracker, Mealplanner, Bullet Journal, MEtime Planner, Brainstorming Ideas & Plans, Things to do, Wish Lists and Important Notes . . . matching all your Plannergirl Needs. 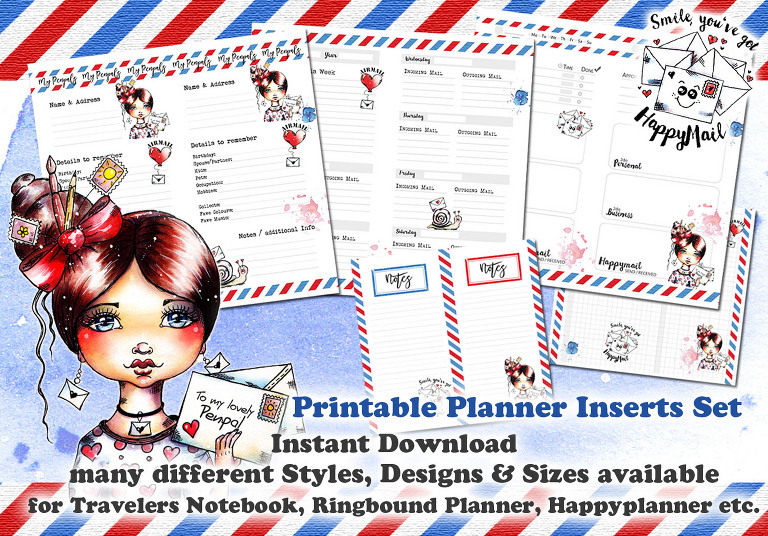 You can check out and purchase all of my available my Planner Inserts in my Etsy Shop with instant download . . . so you can get started to set up your new Planner right away. Sample of a simple Style Planner Inserts Set in a Midori Travelers Notebook . . . Sample of the Plannergirl Inserts Set in Use in a Ringbound Planner . . . Simple Style Planner Inserts pimped with one of my Printable Sticker Sets . . .
My Printables allow you to set up your Planners with a cohesive Look, since most Designs are available for Planner Inserts as well as Sticker Files, digital Stamps etc. . . . this Way matching everything and making it all pretty is easy as 1 2 3 . . .
Hi Andrea, thank you very much for the free version of the Project Life weekly notes. I just printed it out and now I have to decide which size I’d like to work with. So far I have the filofax-versions but I’m not quite sure of having the rings any longer so I’d rather stick to the binded version like the midori. On last question before I’d be glad to buy one of the loveley whole set-Version, do you plan to sell a german version of it?